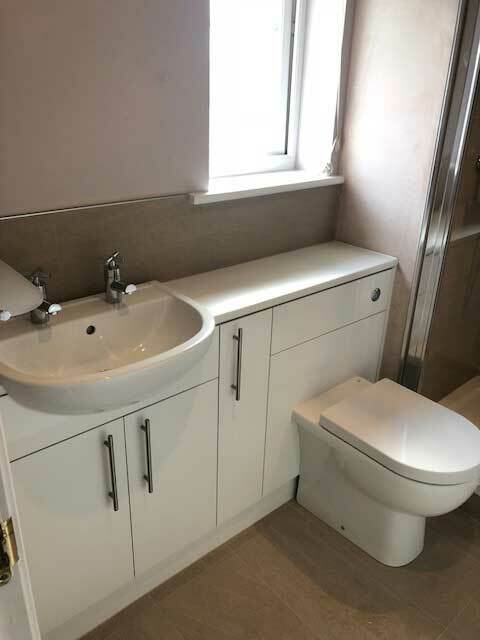 Under stairs cupboard / wc. 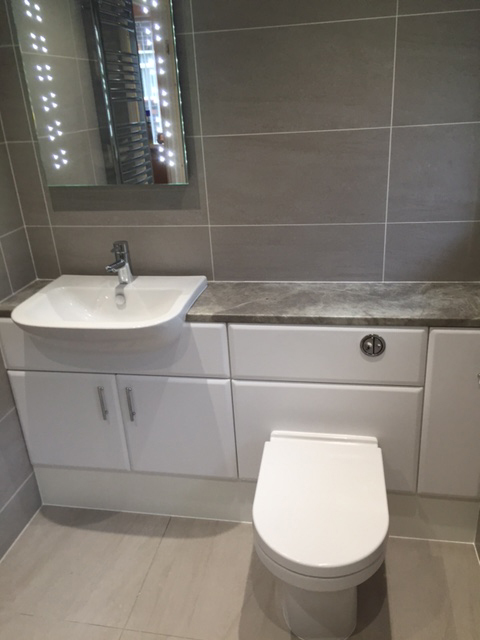 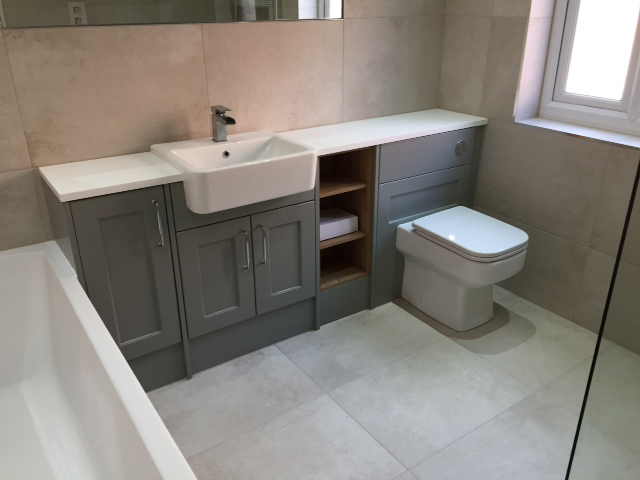 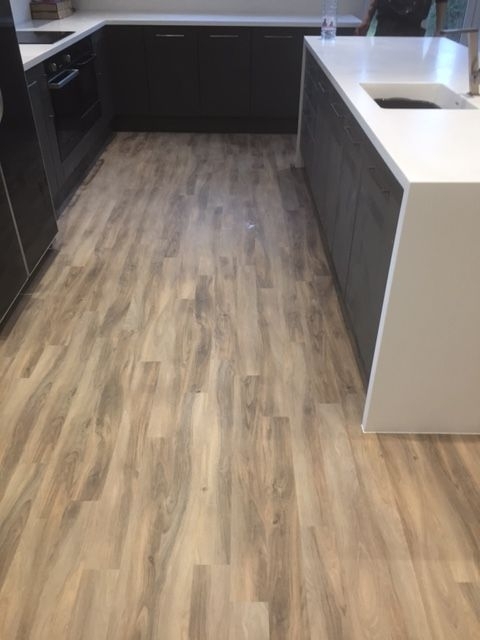 Our client wanted to utilise this small compact area as much as she could with a shelved cupboard section with wc and basin. 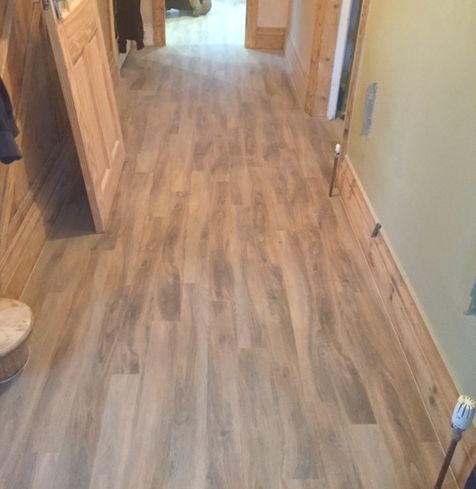 We stripped whole room out. 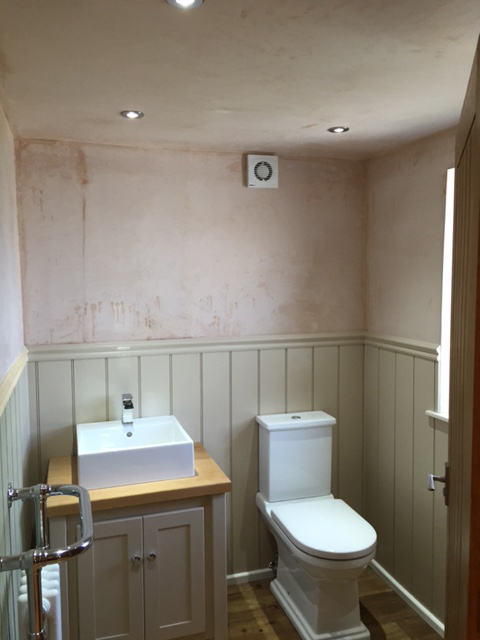 The main electric board was out of date and also the wiring needed to be neater for the finish. 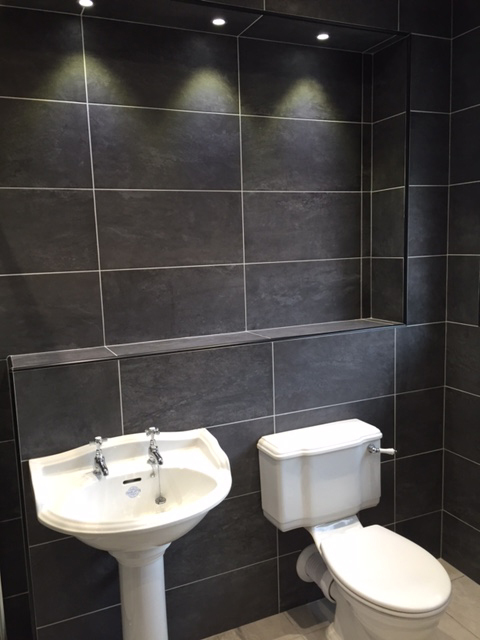 We updated the board up to regulations and re-sited onto the opposite wall with a cables concealed. 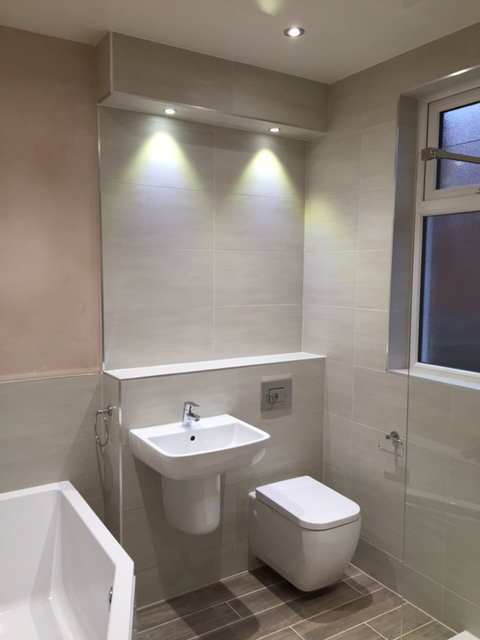 Led light in the wc and pendant fitted in the cupboard switching to the outside of the room. 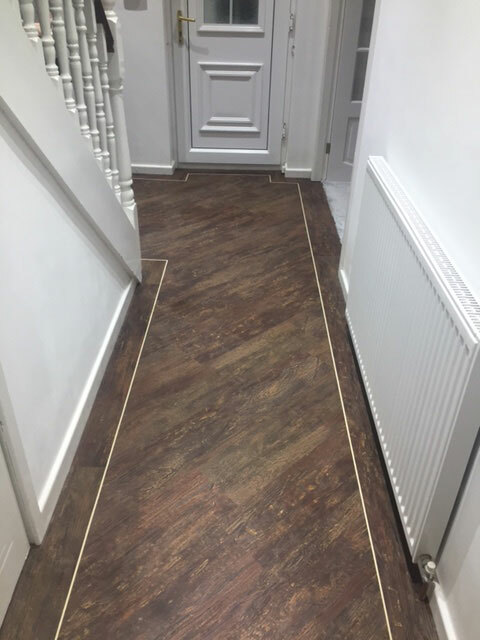 We then re-sited the alarm pad to the outside. 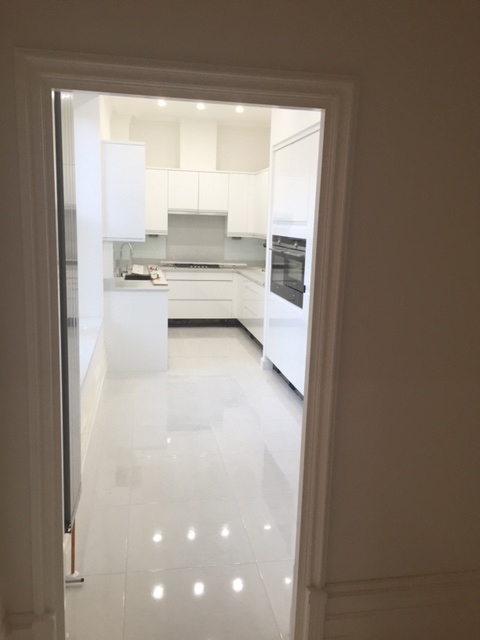 The room was then repaired and fully plaster skimmed, a frame built with a soft close gloss white door separating storage. 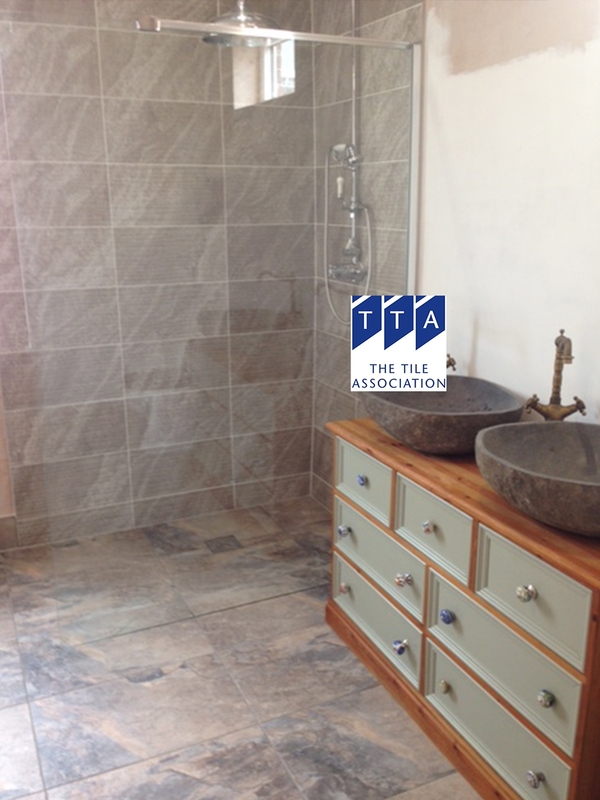 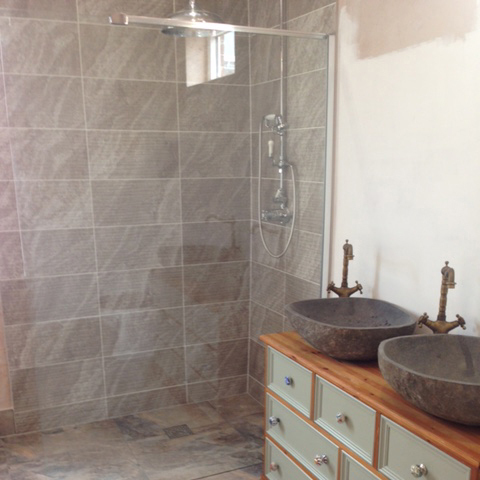 Then we installed 3 shelves in cupboard, tiled the floor with a traditional style tile and installed a compact basin / tap. 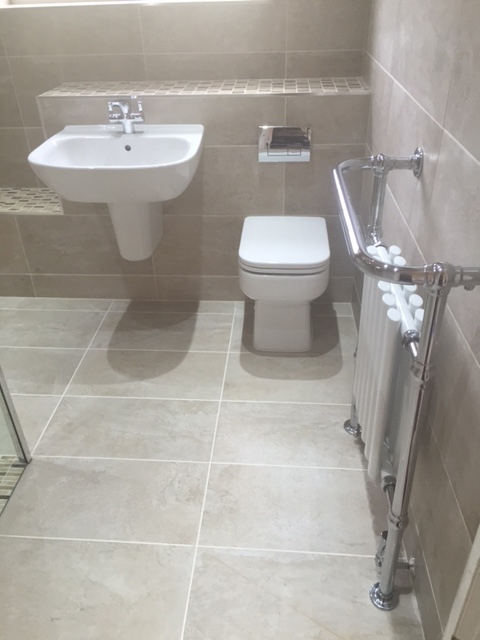 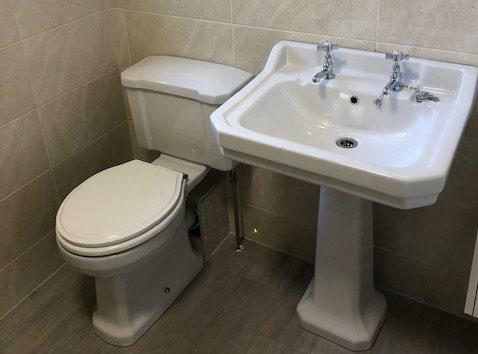 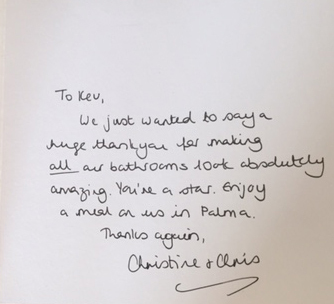 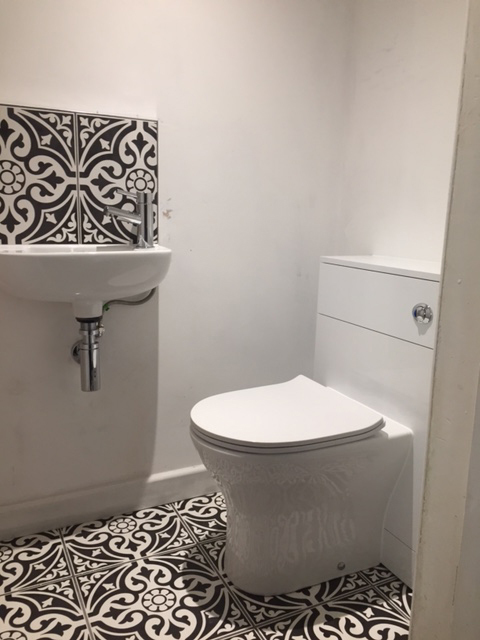 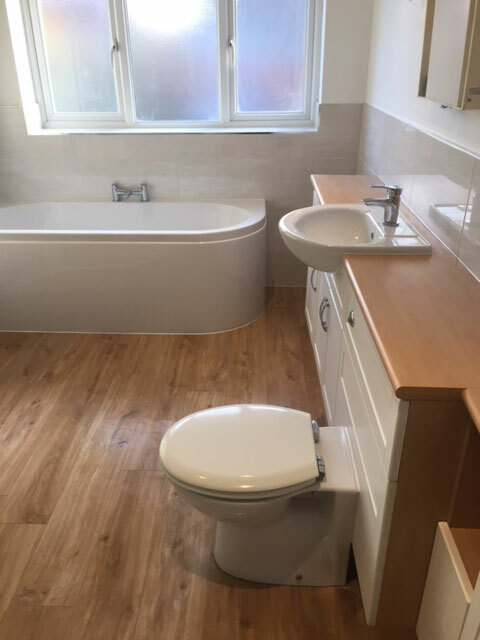 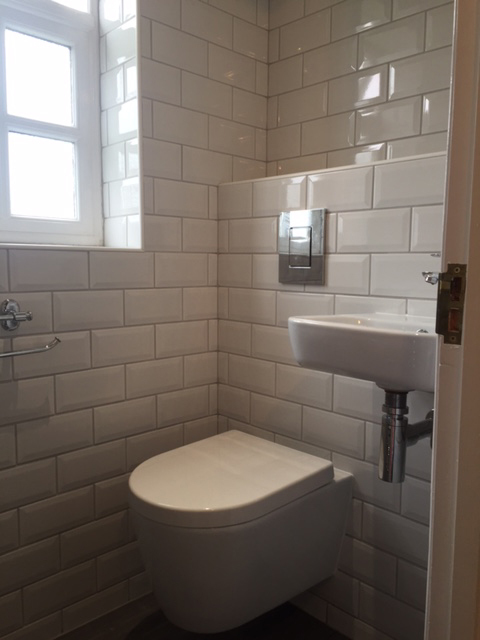 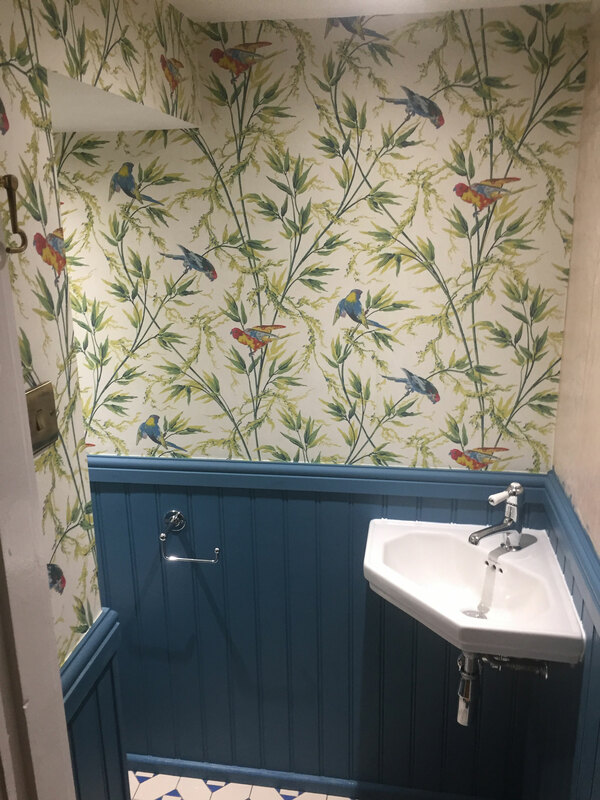 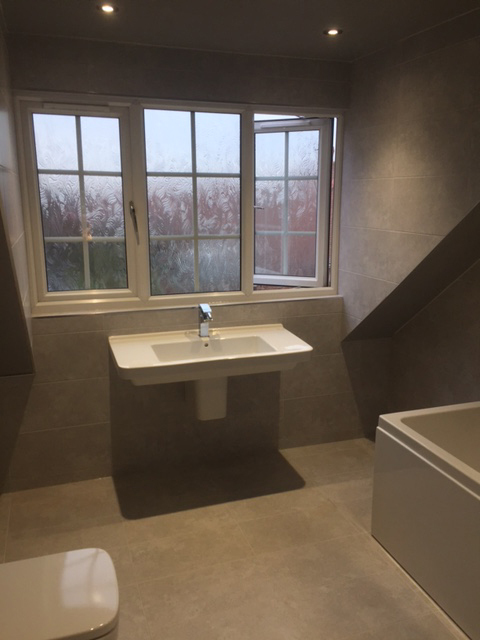 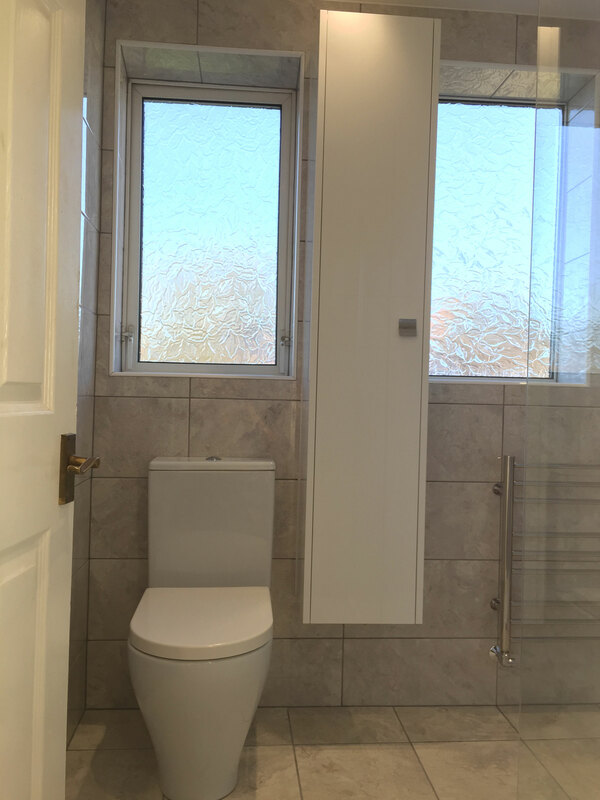 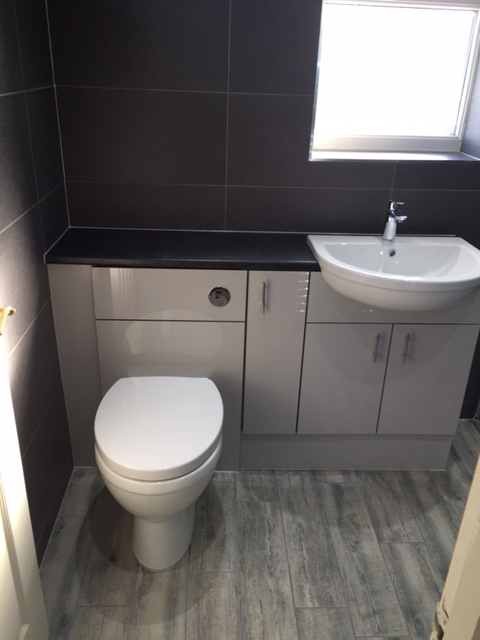 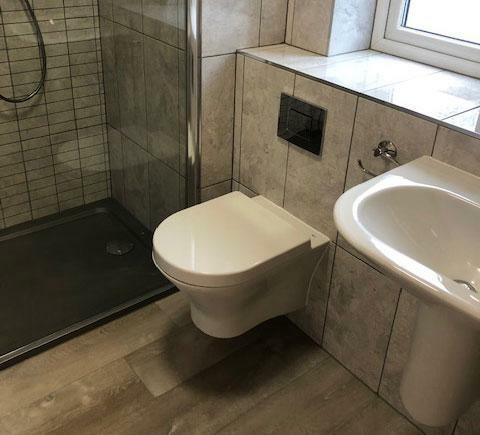 Finally, we installed a toilet unit with pan and soft close seat more..
Julie Lightfoot MBE from South shields required us to renovate her small bathroom, but just shows what we can do with a small space. 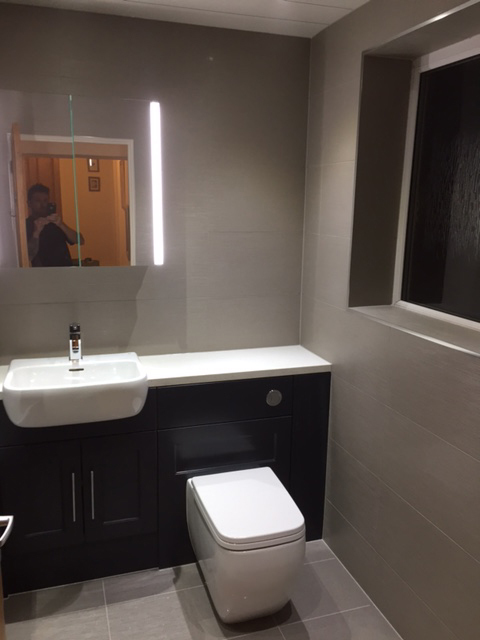 The old bathroom was dated and a simple design, the client wanted a classy chic look with some added lighting and storage. 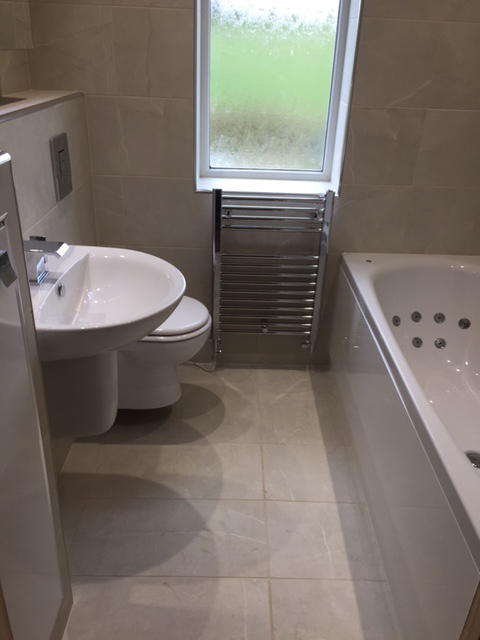 As with every bathroom all old pipework cut out and renewed. 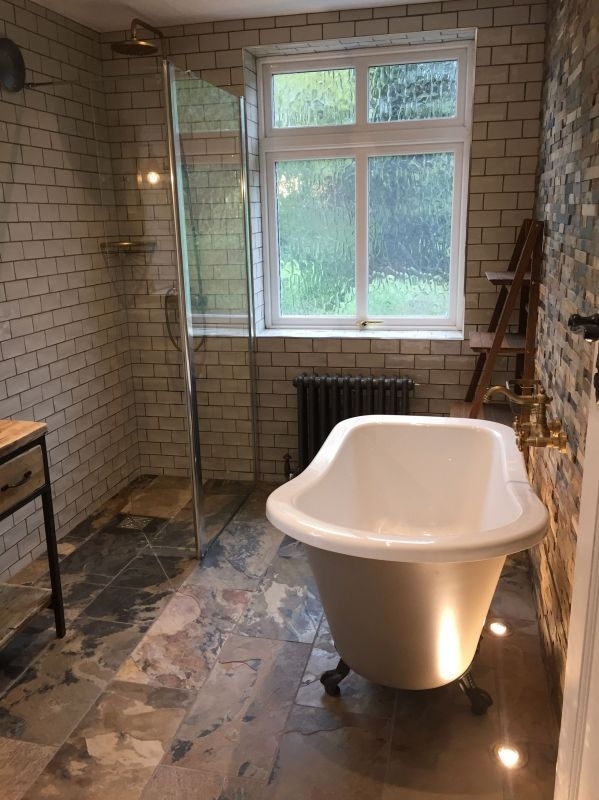 A frame was constructed at the foot of the bath to accommodate the 1500 shower bath and form a niche in which we installed 3 x led lights and had glass shelves made to size so the client could put candles on. 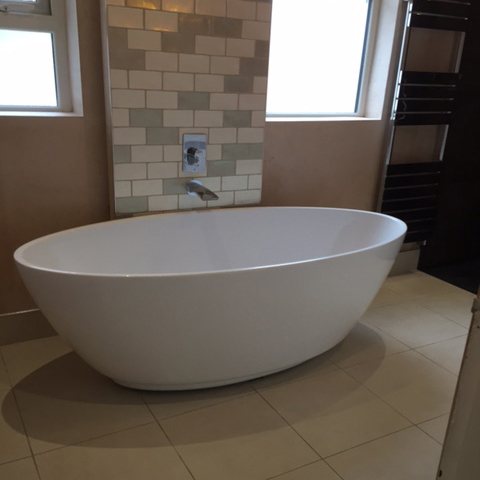 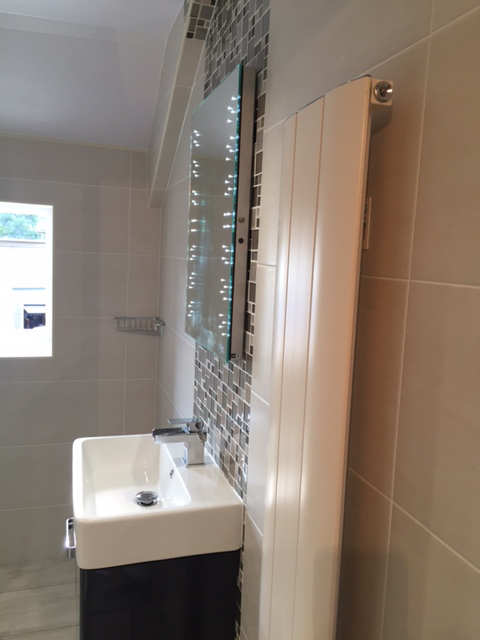 Bath framed flush edge and floating with led strip lighting on the underside. 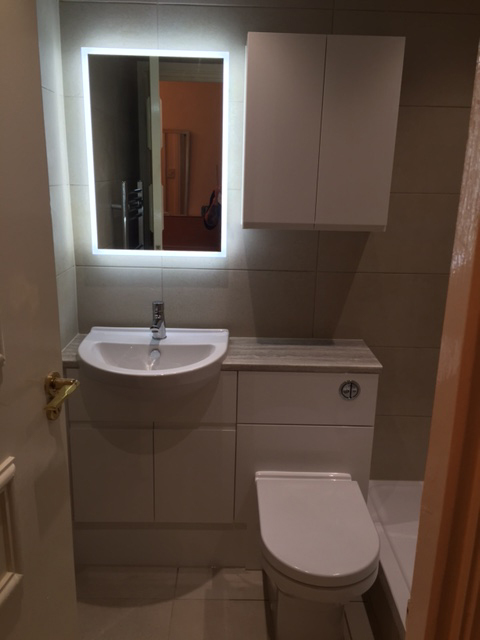 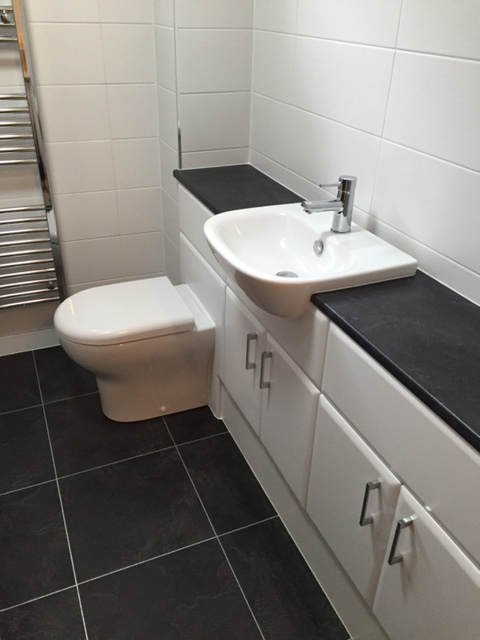 We then installed a free standing gloss white wc and basin unit with solid composite basin top. 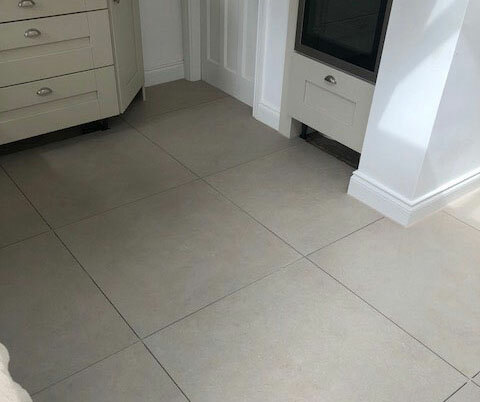 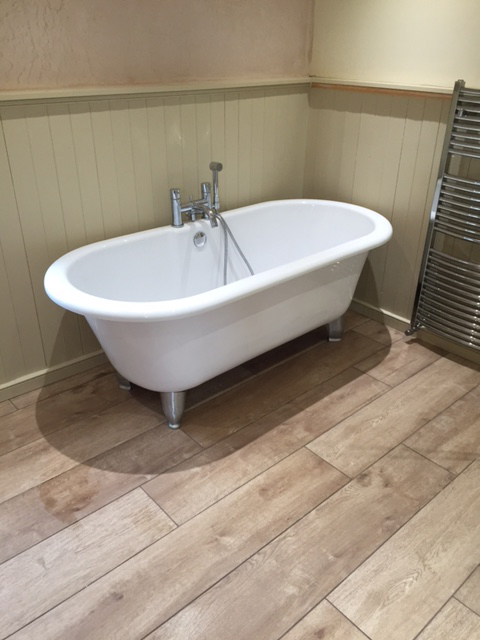 Thermal tile backer-boards installed with underfloor heating. 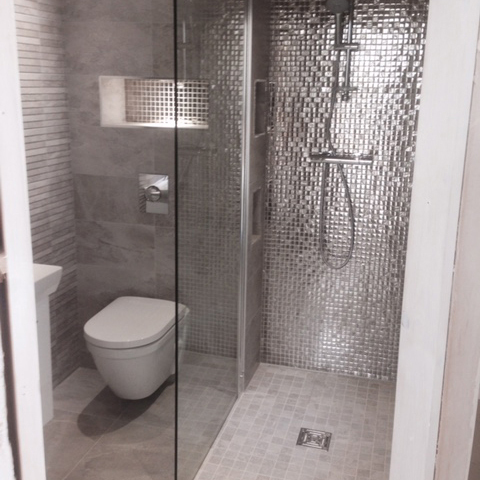 An aqualisa mirror chrome electric shower was installed along side a shower bath with screen. 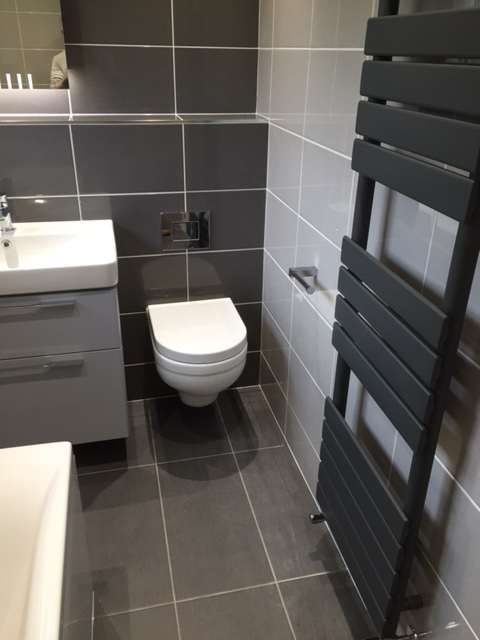 A Reina towel radiator with electric thermostat fitted. 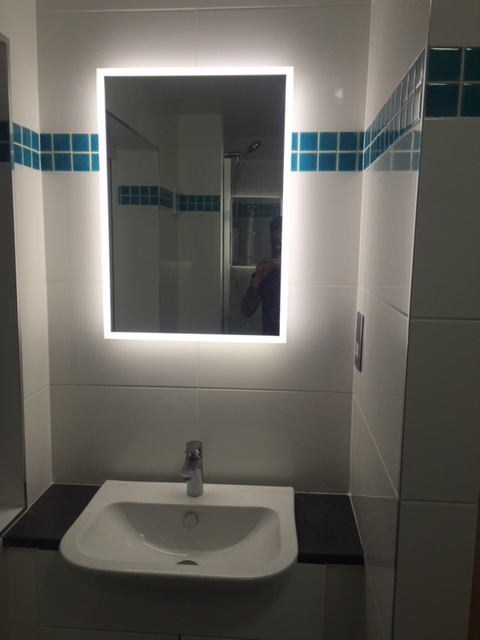 We then plaster skimmed the ceiling with 4 x led rated down-lights, We fitted a large bespoke mirror. 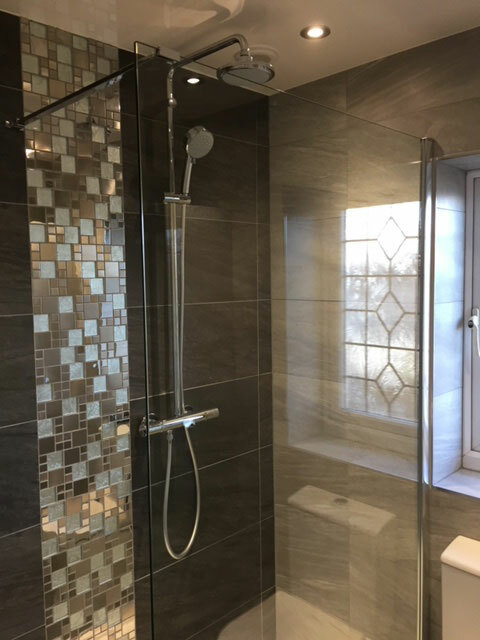 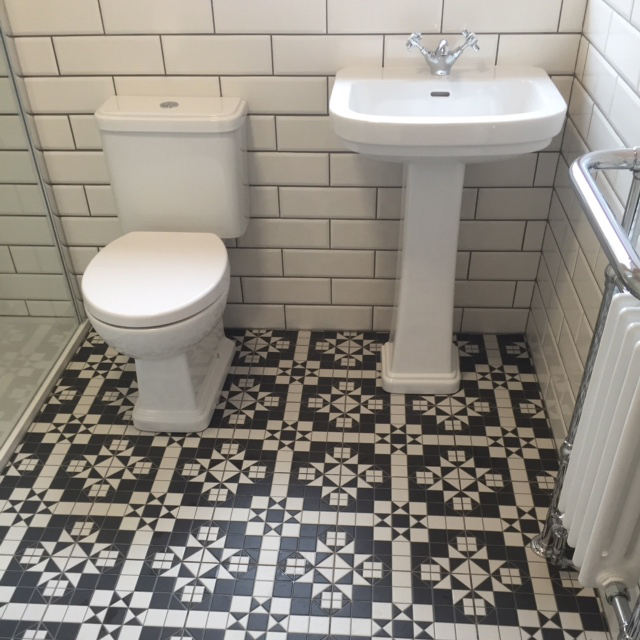 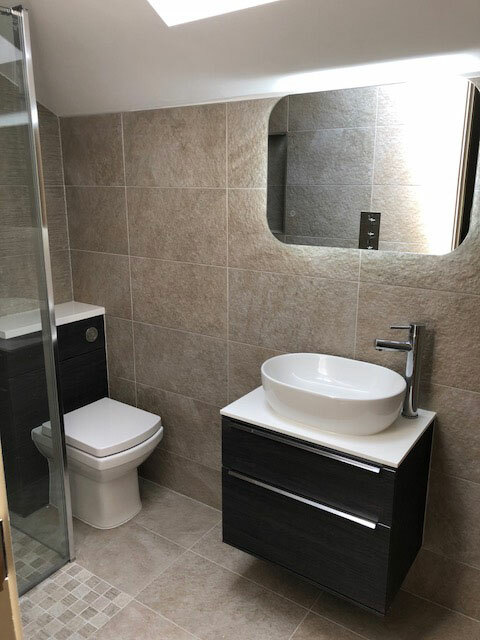 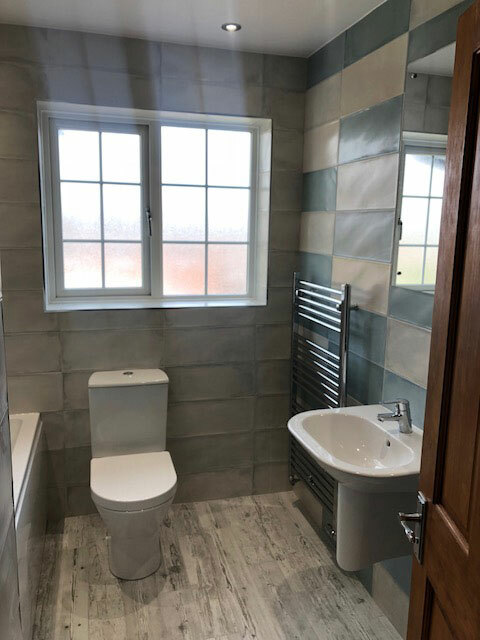 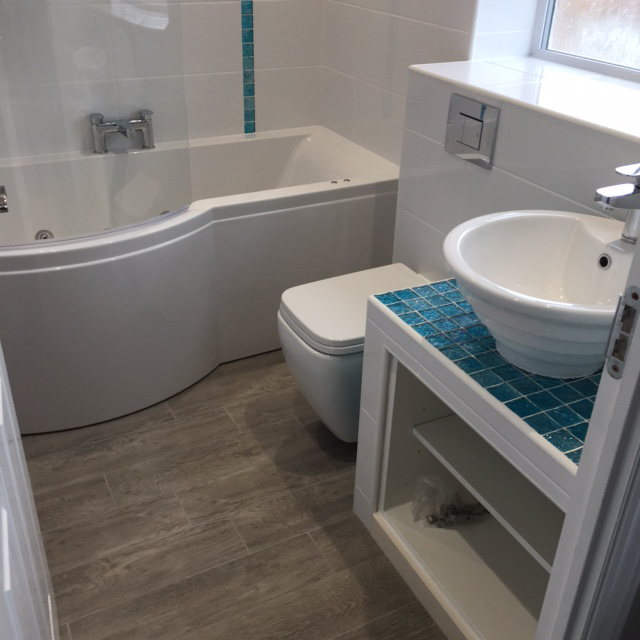 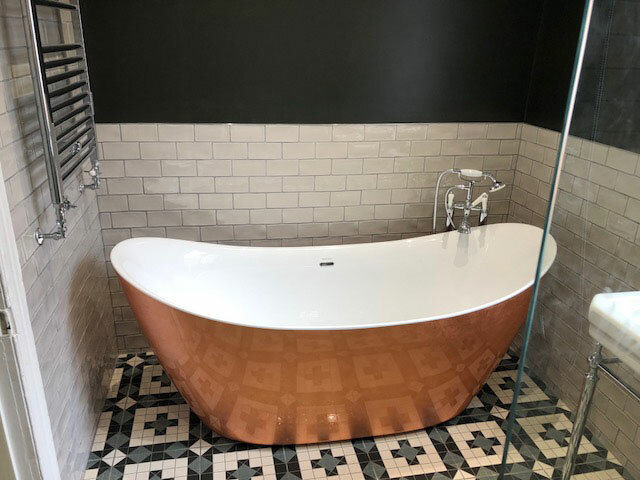 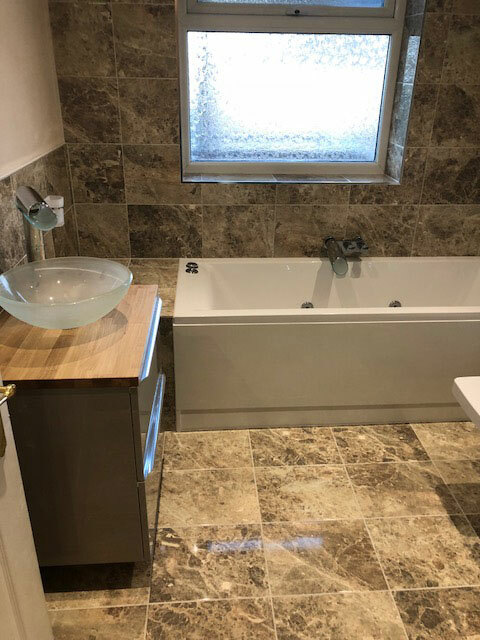 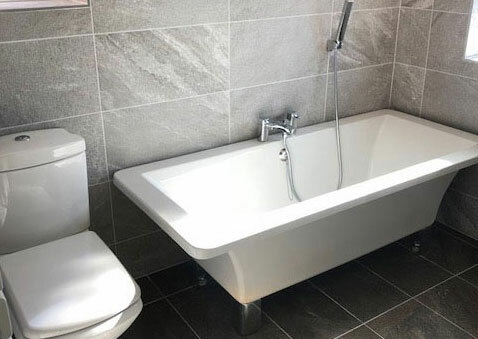 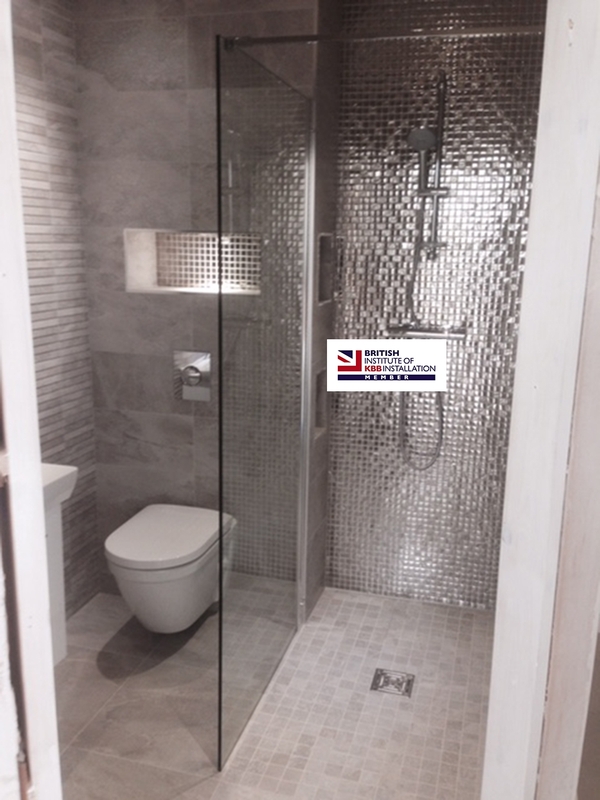 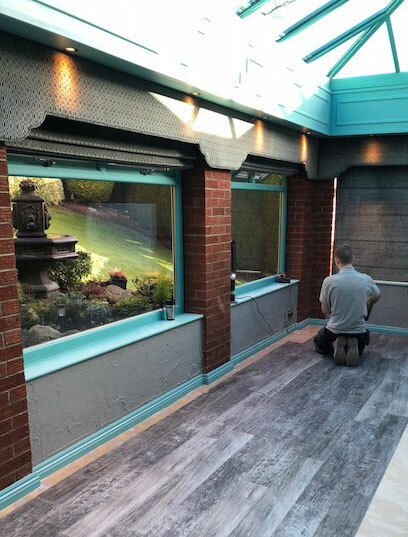 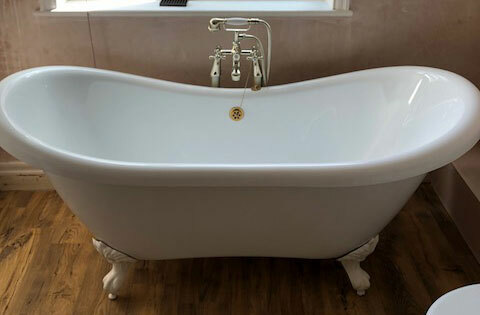 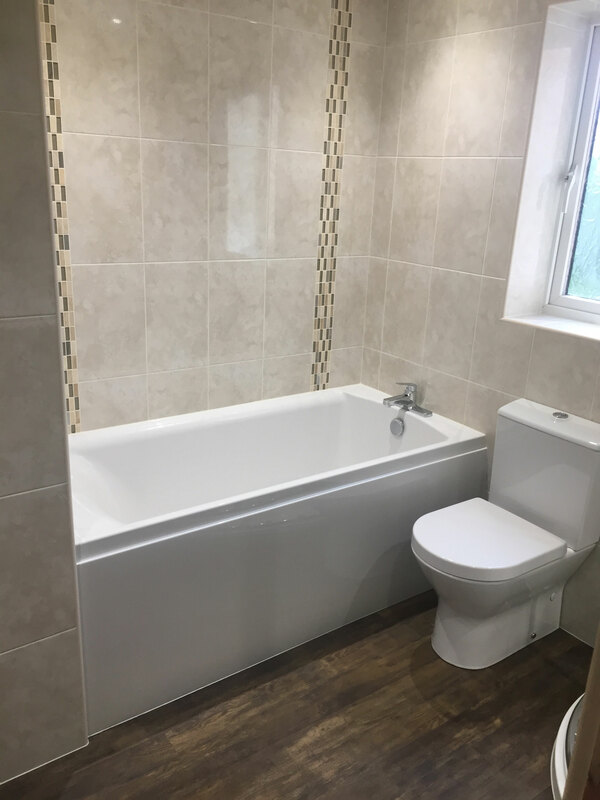 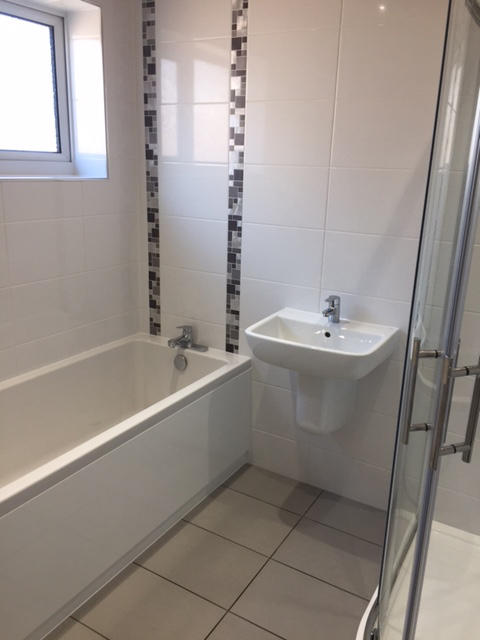 Finally, we fully tiled walls & floor with feature mosaic work in niche and bath wall and behind radiator to highlight more..
Mr and Mrs Parker from Forest hall need their bathroom refurbished.The original bathroom comprised of a standard 1700 x 700 bath, basin, toilet and towel warmer. 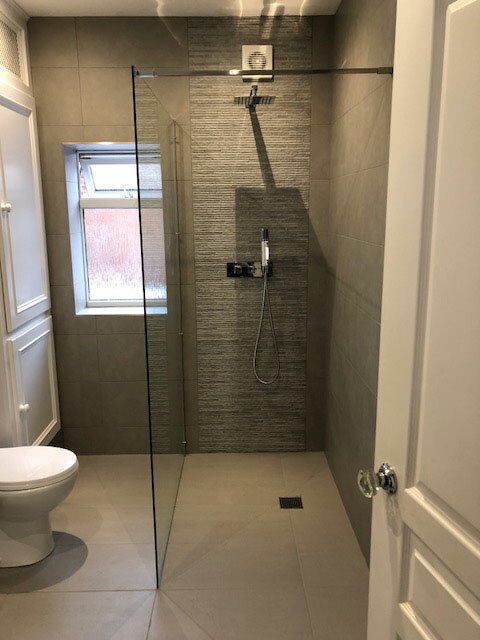 The client wanted a walk in shower but a wider opening than 700 so we had to re-site the door frame to accommodate a 900 width thus resulting in renewing architraves, skirting and dado on the landing side of the room, repairing and re plastering the wall also. 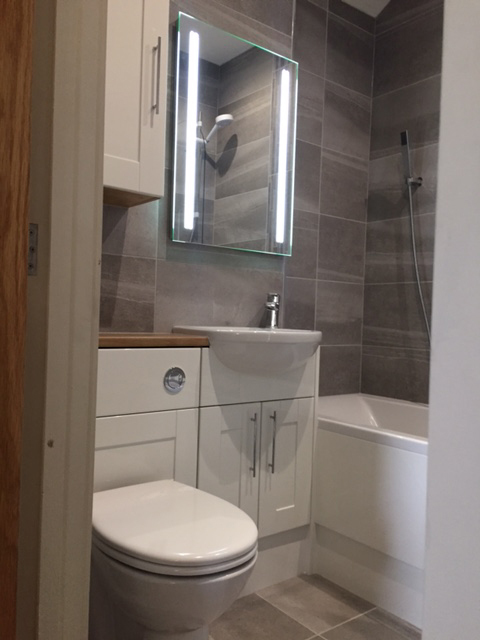 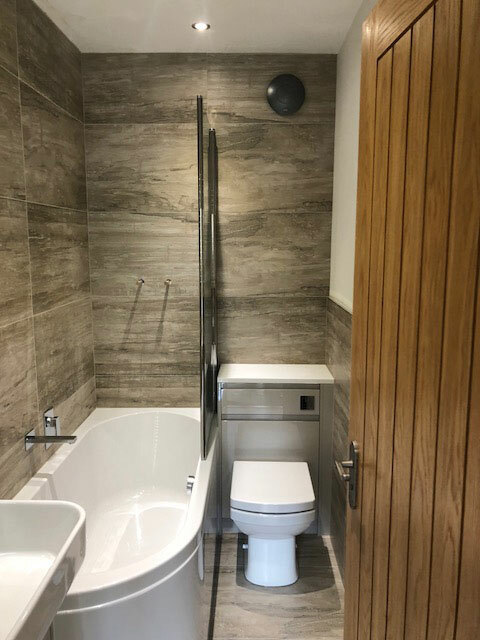 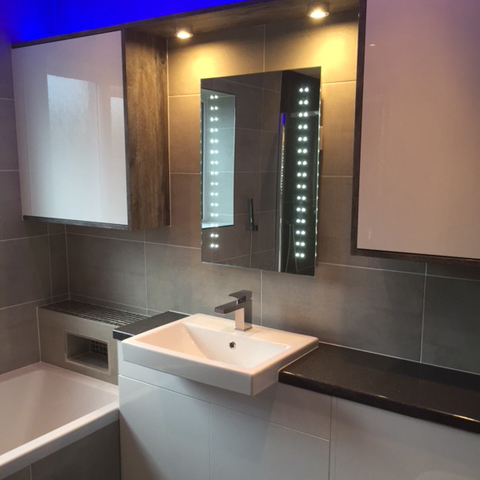 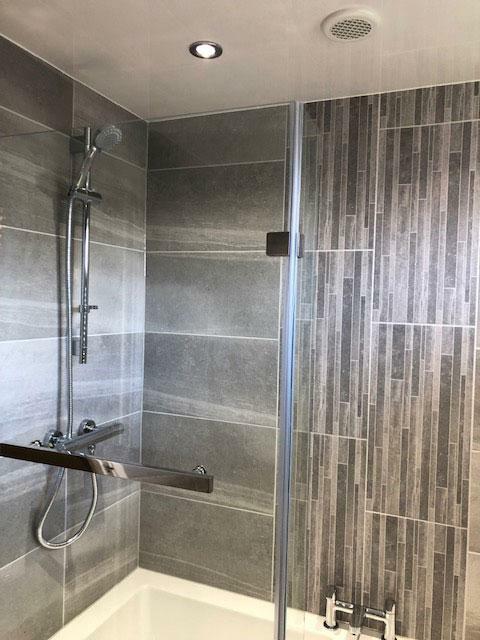 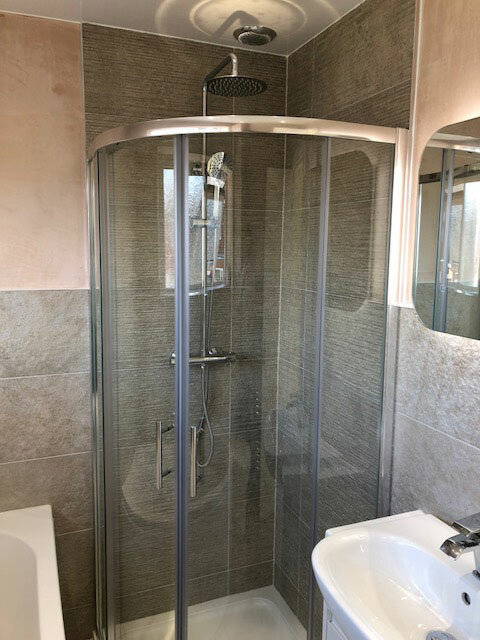 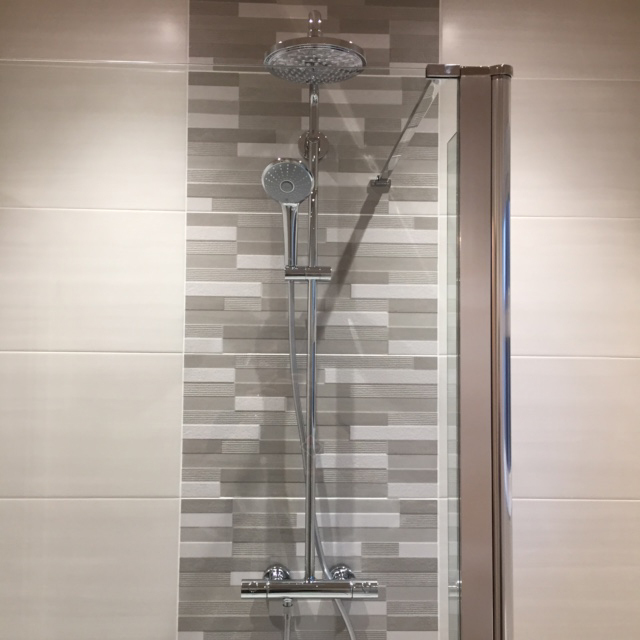 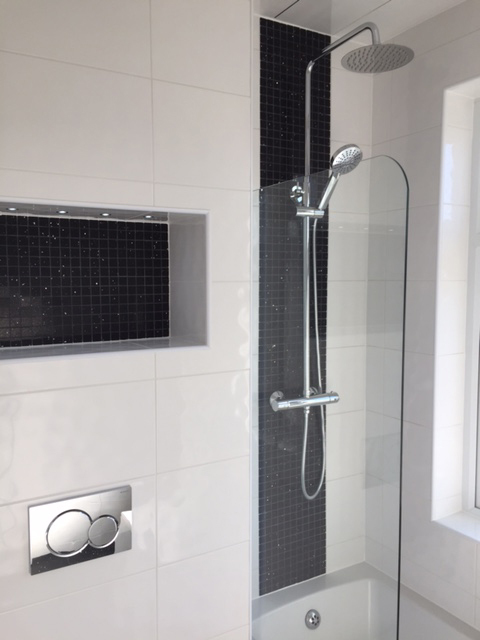 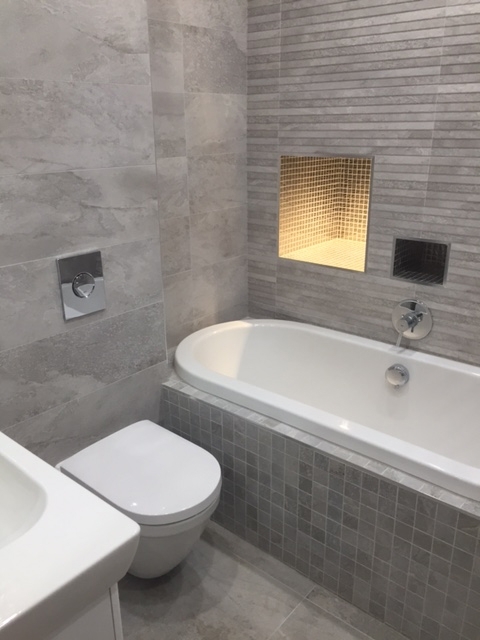 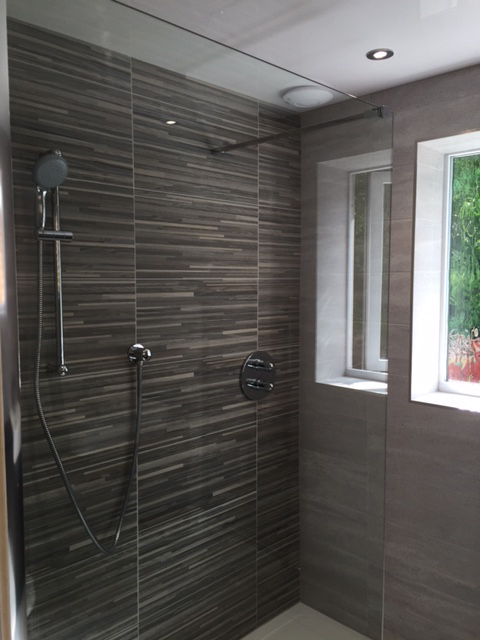 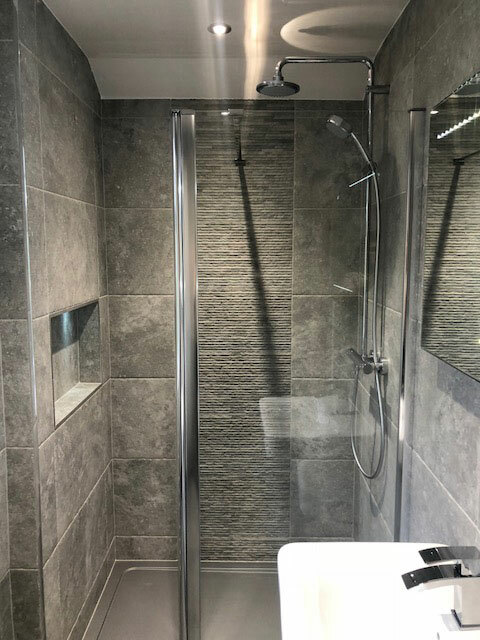 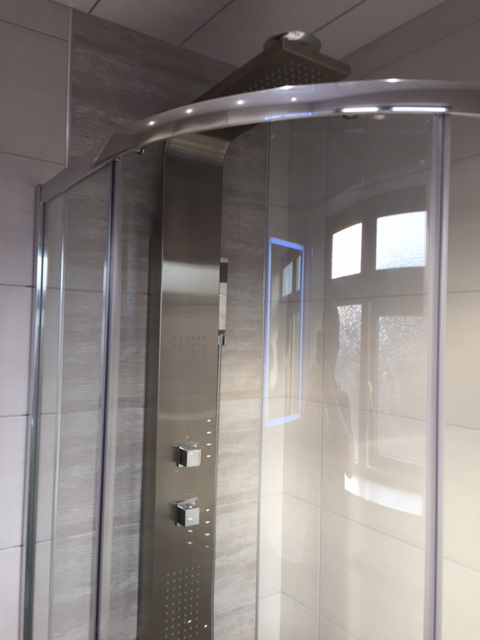 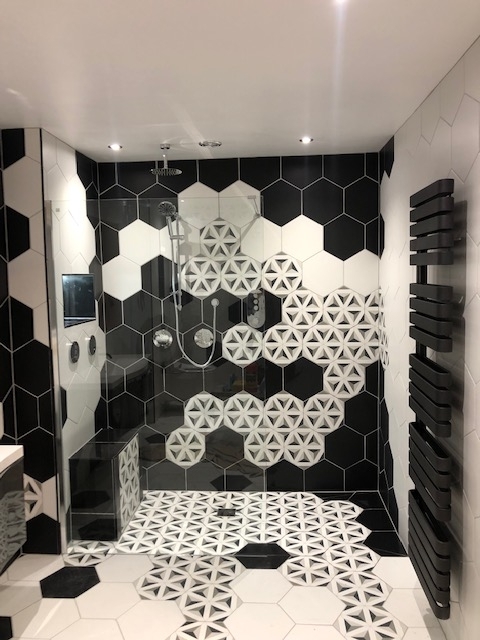 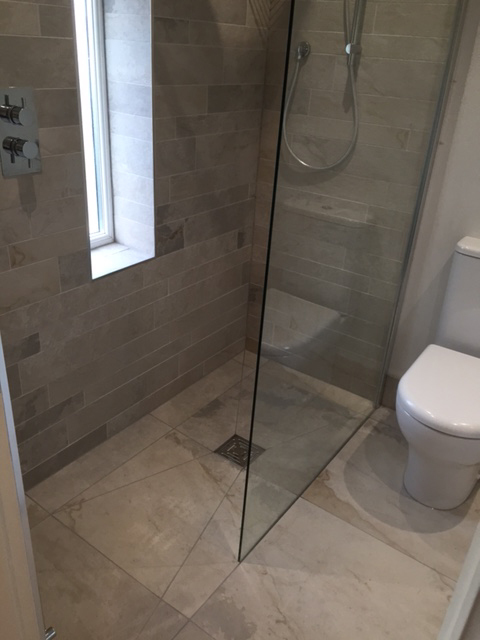 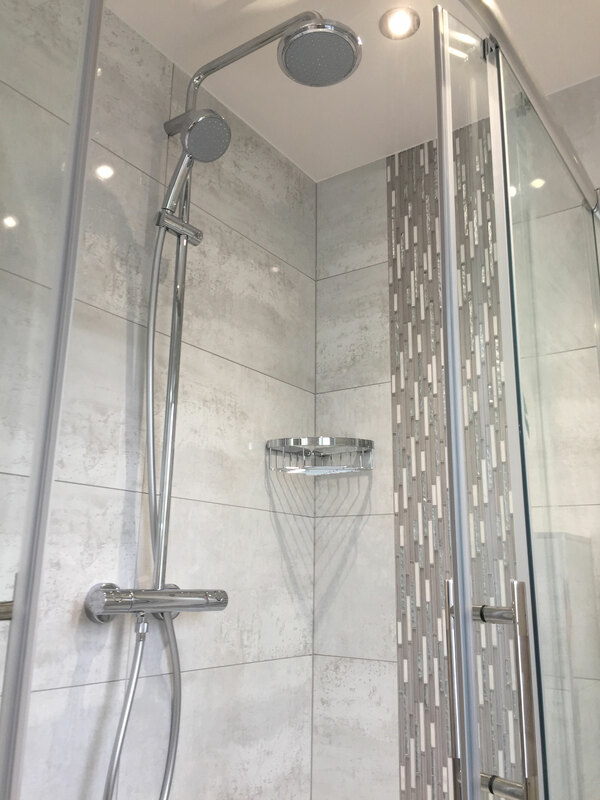 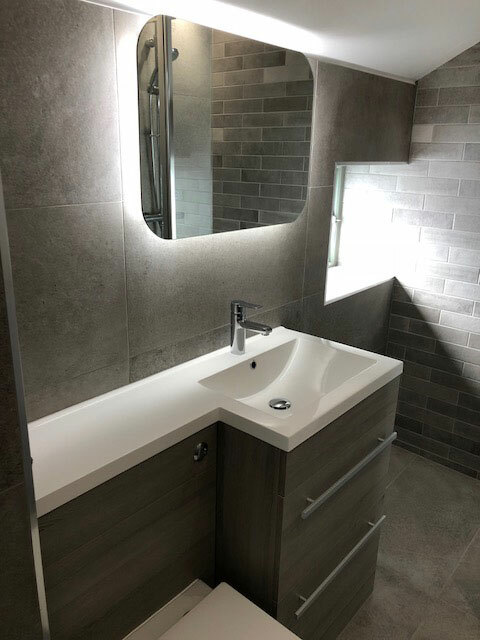 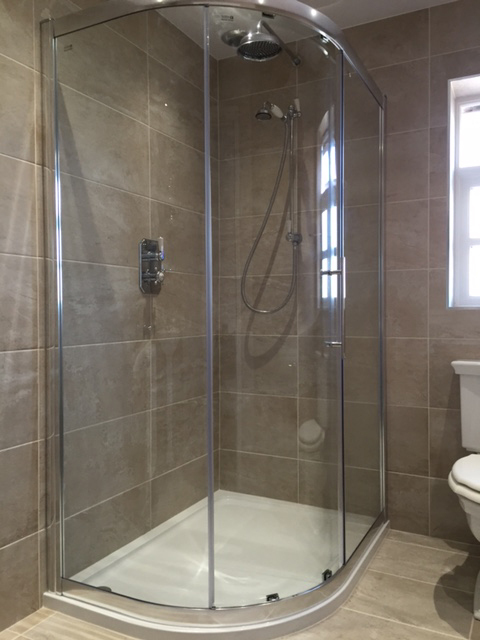 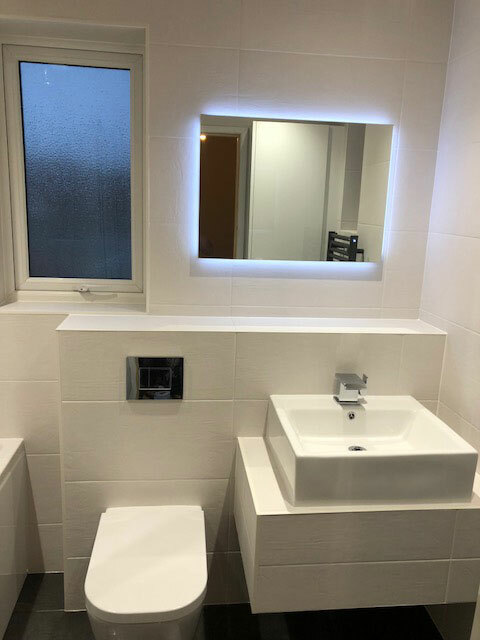 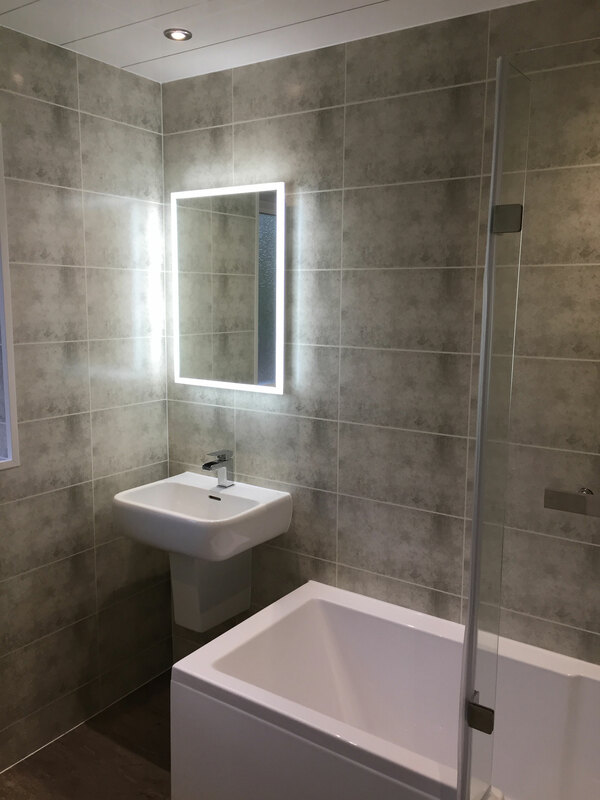 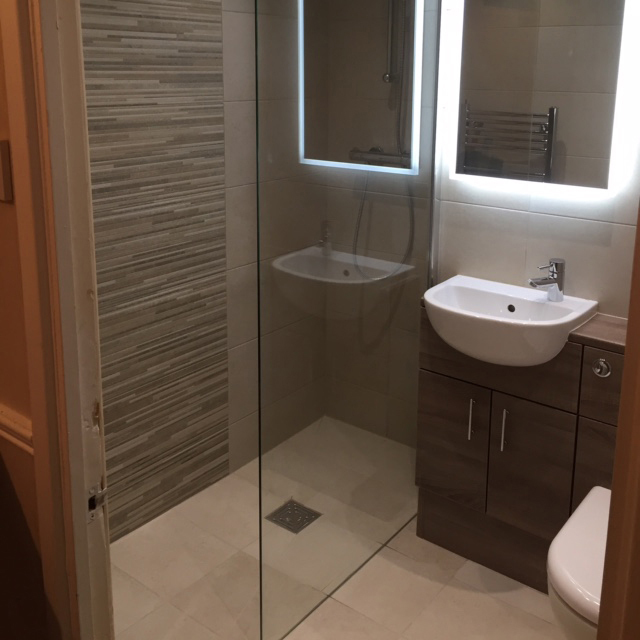 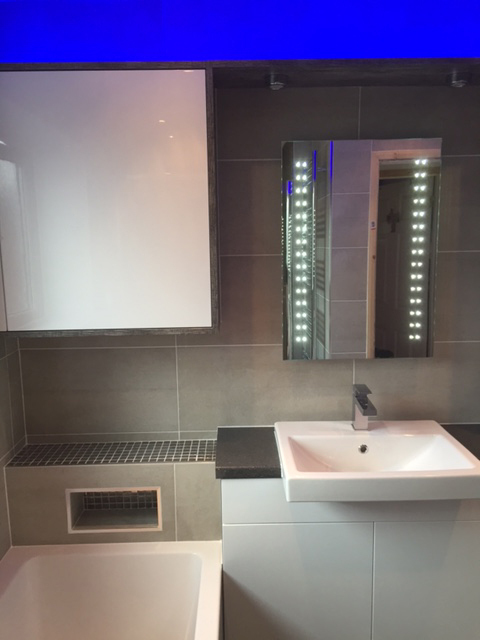 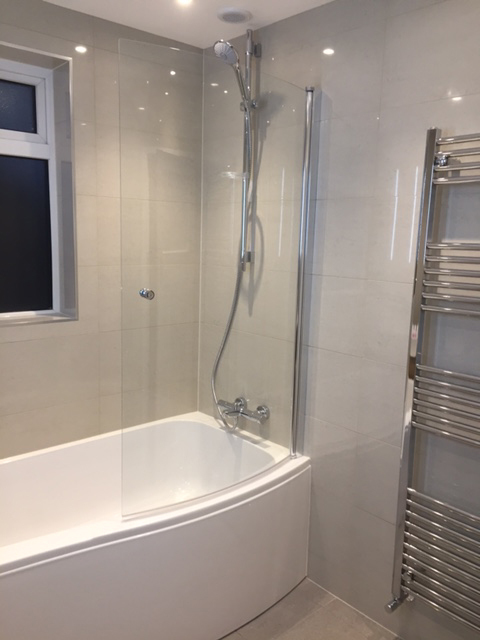 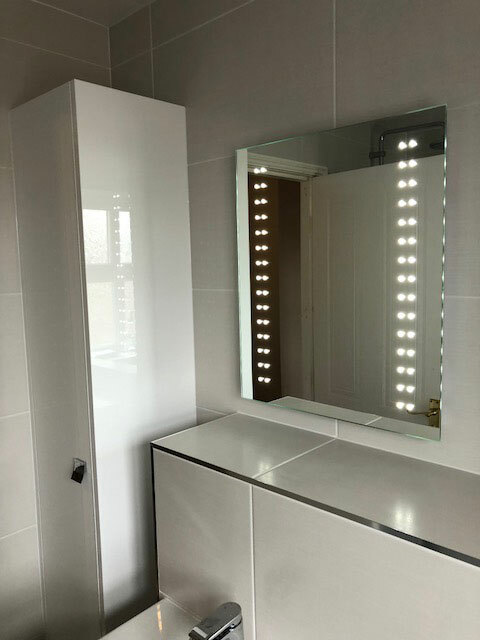 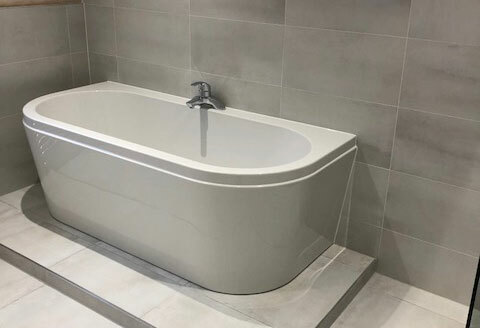 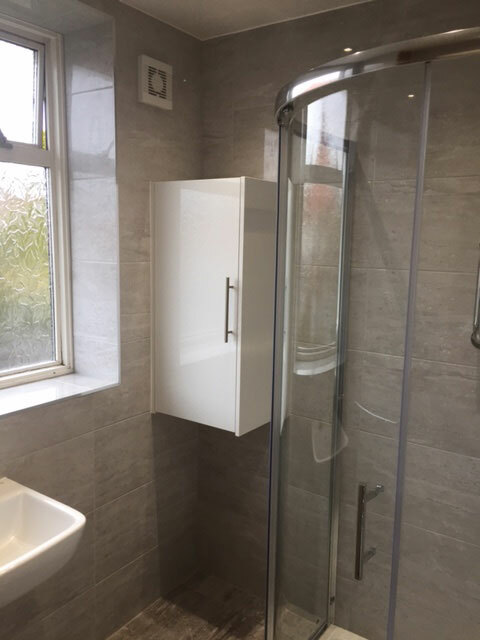 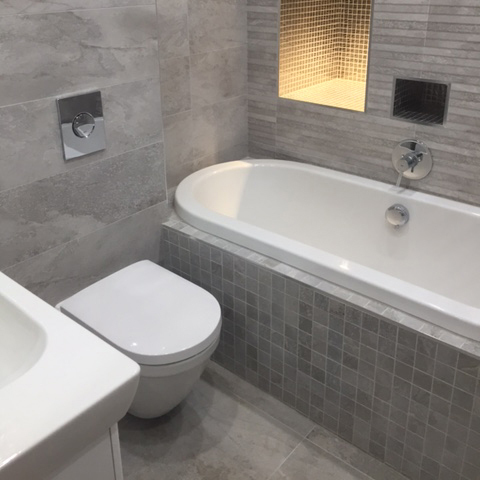 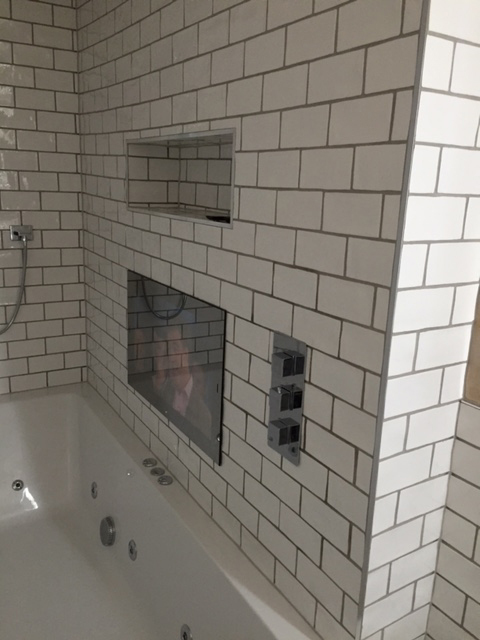 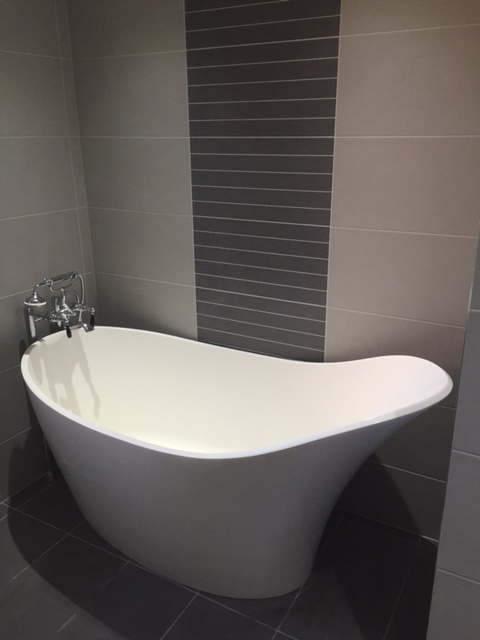 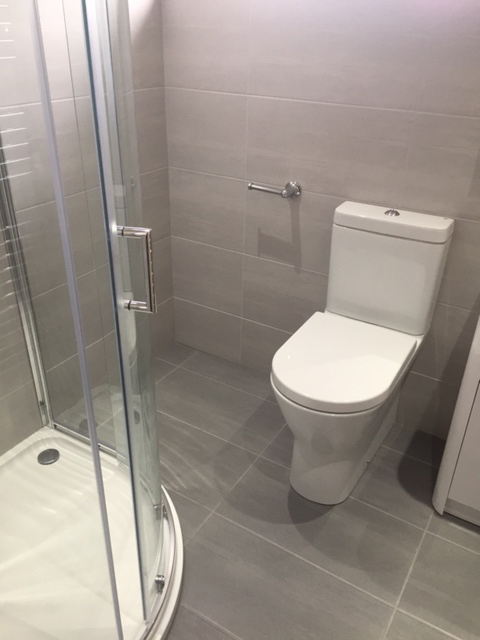 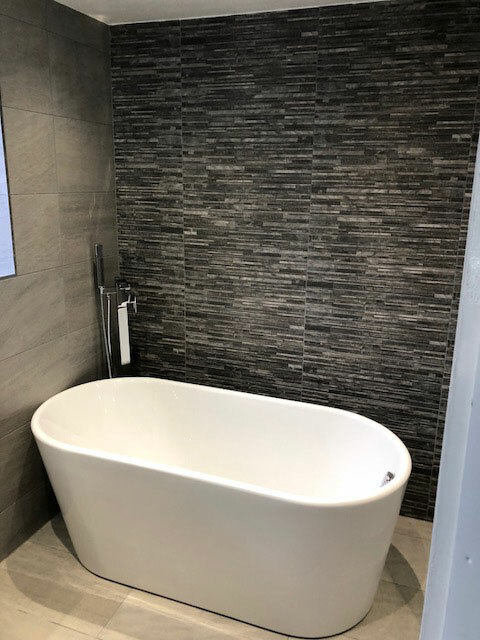 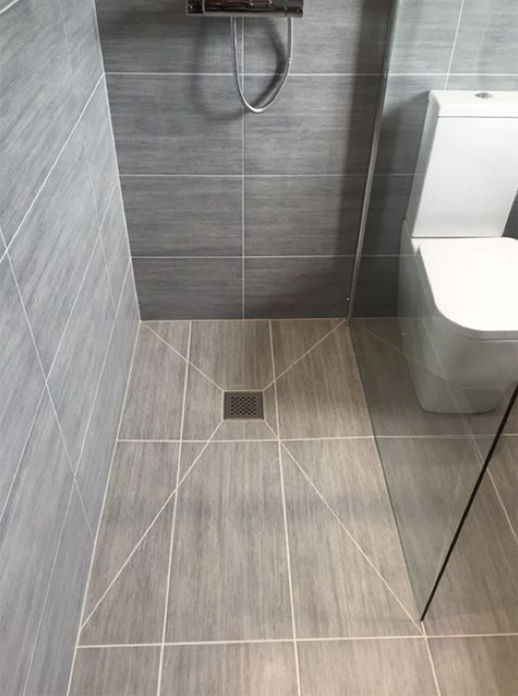 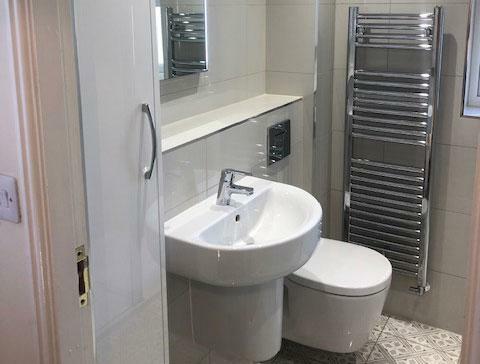 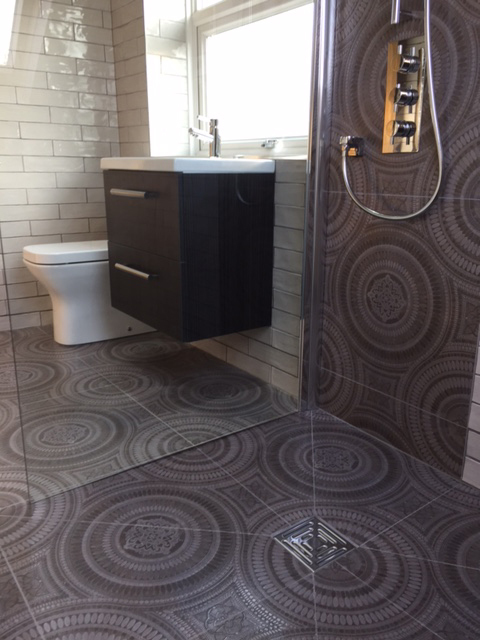 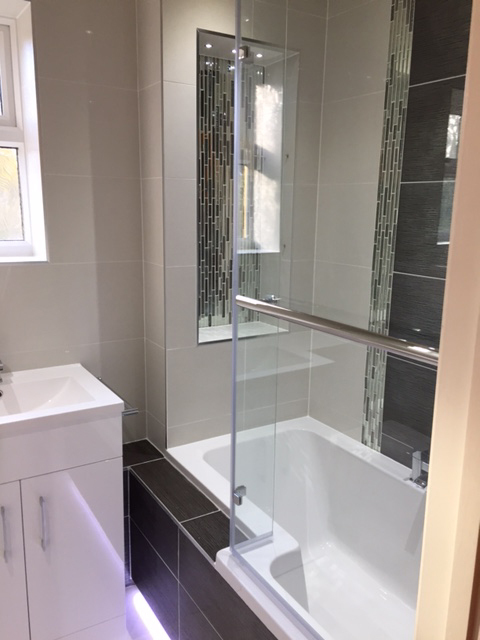 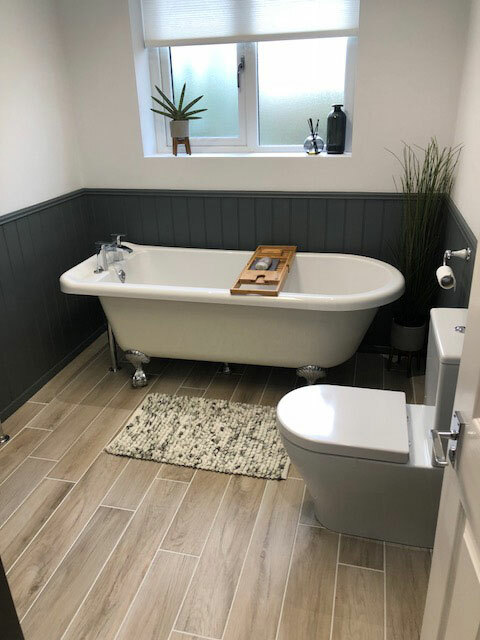 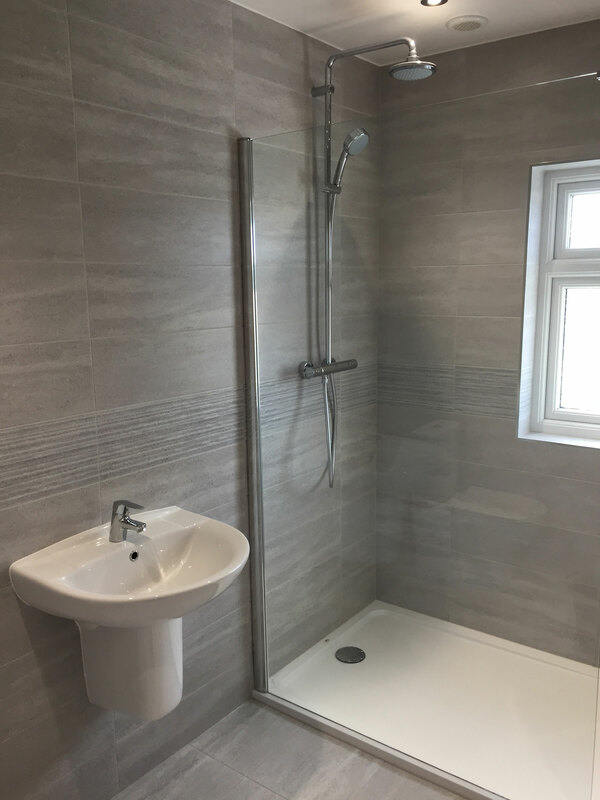 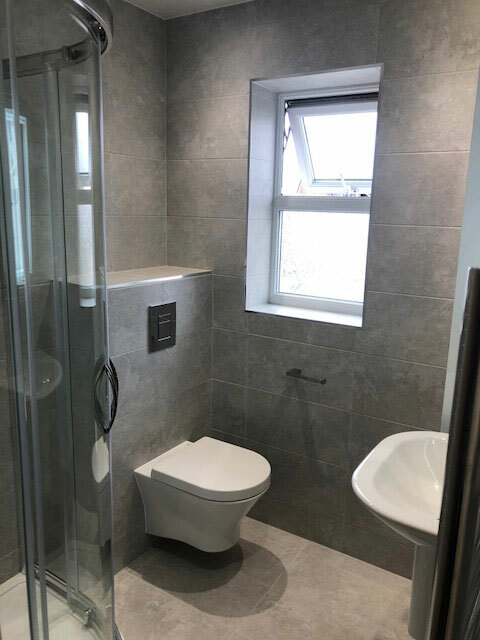 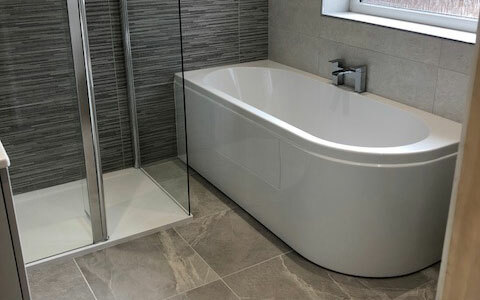 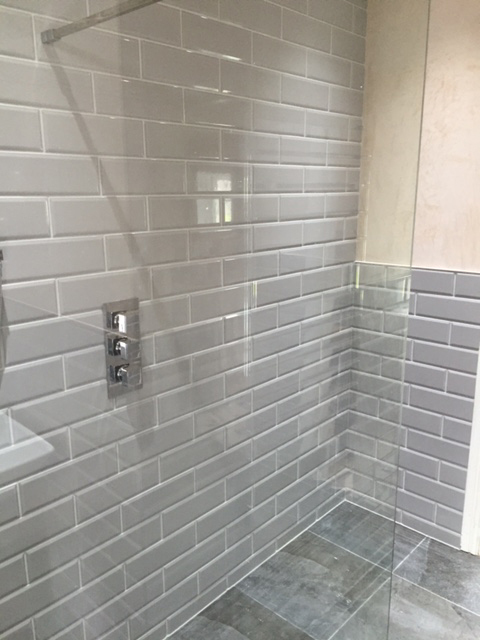 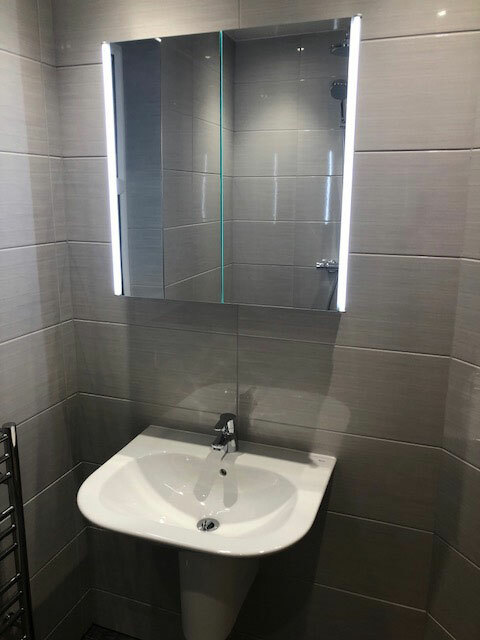 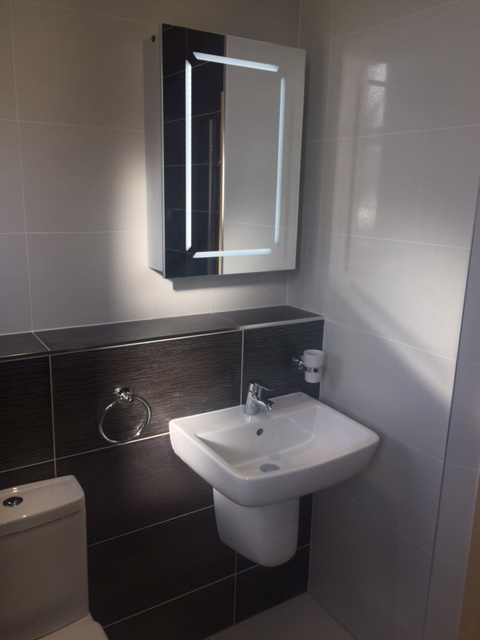 We installed a thermostatic shower, fully fitted bespoke furniture comprising of a toilet and basin and tap, Led mirror, 1700 towel warmer, PVC matt white ceiling, 6 x down lights and fully tiled the walls and floor. 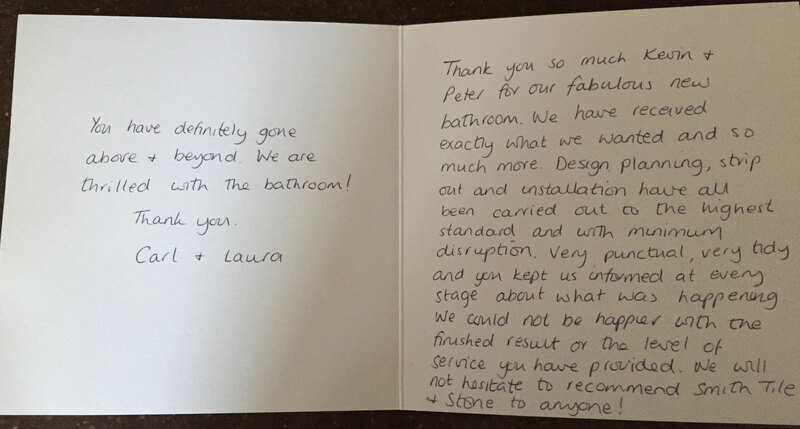 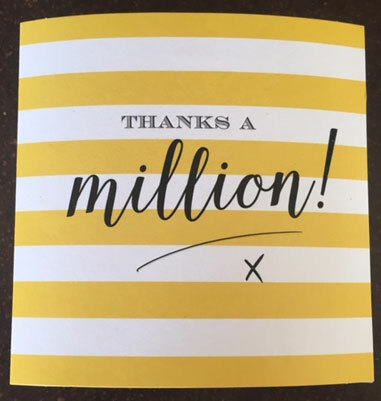 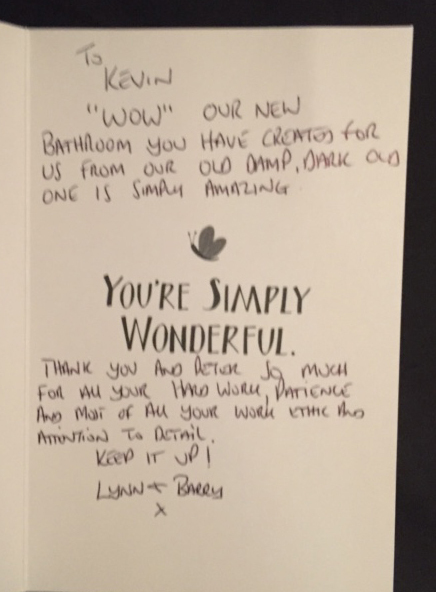 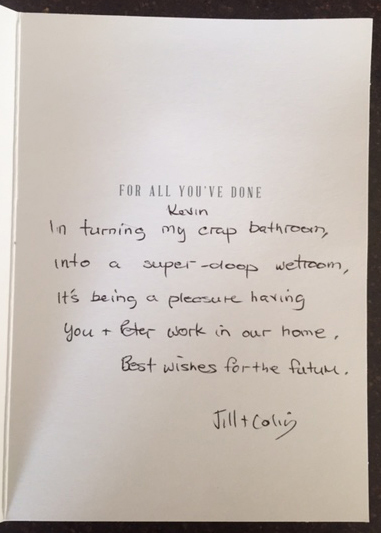 We completed a job for Susan from East Boldon. 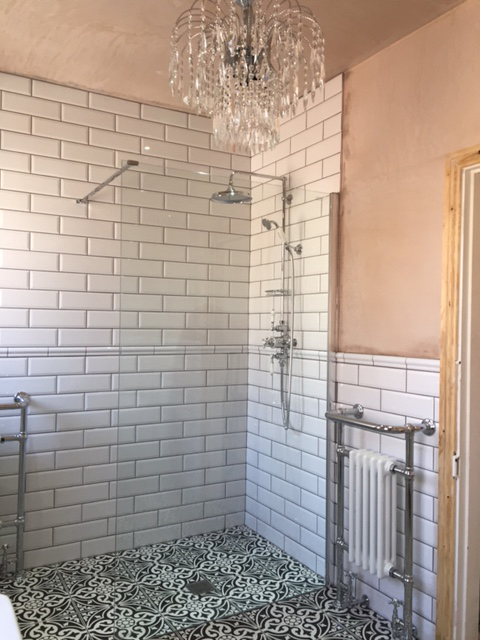 Walls partly tiled and the rest plastered. 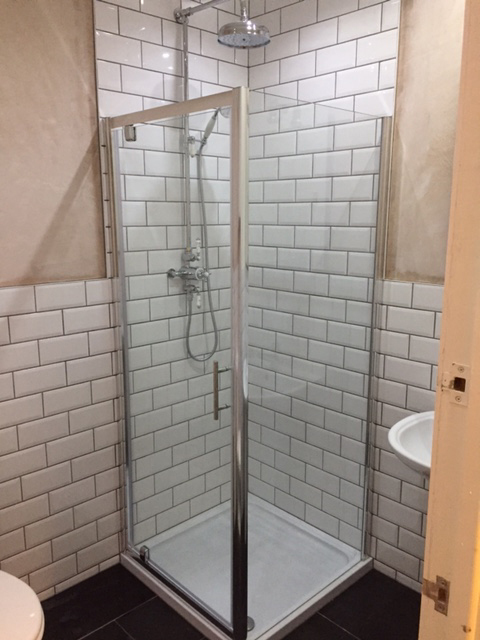 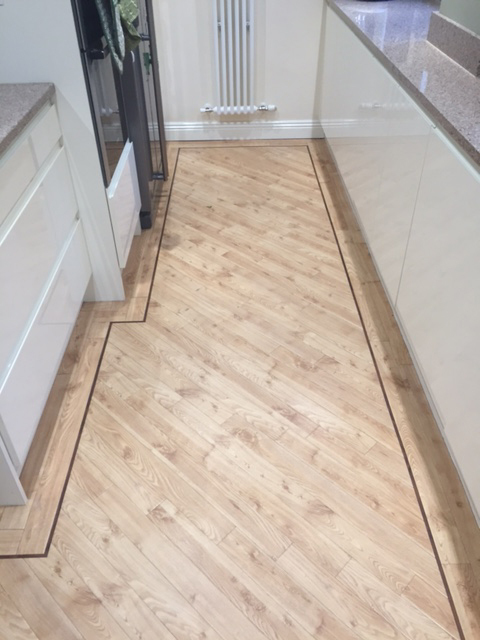 We also completed a job for Michael of Prudhoe.